With Google Slides, which is the free slideshow presentation functionality built into Google Drive, you can create slide presentations just like you can in Microsoft PowerPoint. In fact, when you open Google Slides, you may think you’ve just opened PowerPoint! 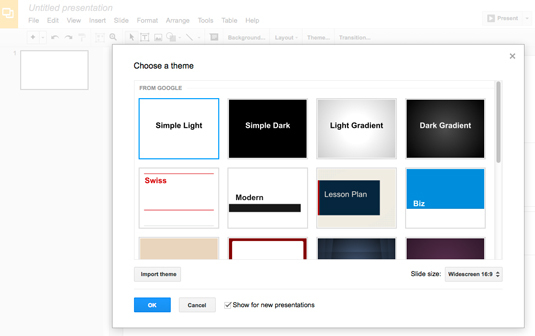 Google Slides has the basic functionality that PowerPoint has, such as inserting and deleting slides, formatting text, inserting images, presenting the slideshow, and so on; however, it lacks the more advanced features of slideshow presentation software, such as recording presentations and tracking changes. For those features, you’ll need a program like PowerPoint. The fact that Google Sheets is a web-based application makes collaboration with colleagues much easier. Because the application and the files are stored on Google Drive, you and your colleagues can edit the same document at the same time, with no concern for overwriting each other’s changes. So, if you working on a presentation for the annual sales meeting with several other people, each person can tackle a section of the presentation with no worries. To start a new document, click the red New button in the upper left corner. Choose Google Slides. A new browser window or tab appears asking you to choose a theme for your new presentation (see Figure 1). Click the theme you can and click OK. If you don’t want to see the theme chooser when you open a new presentation, uncheck the Show for New Presentations box. Figure 1: Choose a theme for your new presentation. You don’t have to manually save your slideshow. Google Drive automatically saves it for you. Google Slides enables you to open Microsoft PowerPoint slides as well. Just upload a PowerPoint presentation to your Google Drive and double-click it. You can view, print, or share the presentation; however, you can’t present or edit it. To do that, you have to open it in Google Slides by clicking the Open button at the top of the viewer. The presentation is converted and saved as a separate Google Slides document that you can edit or present. To create a new document, tap the yellow circle with the plus sign at the bottom right. A new document appears on your screen. Right now, you can’t do much with the Google Slides app. You can format text or insert new slides and basic shapes into your slides, but that’s about it. Frankly, you may not want more than that, because trying to edit a slideshow on a small screen doesn’t seem practical. However, one great thing the app does is that it enables you to present a slideshow from our smartphone or tablet, so don’t need to lug around your computer.